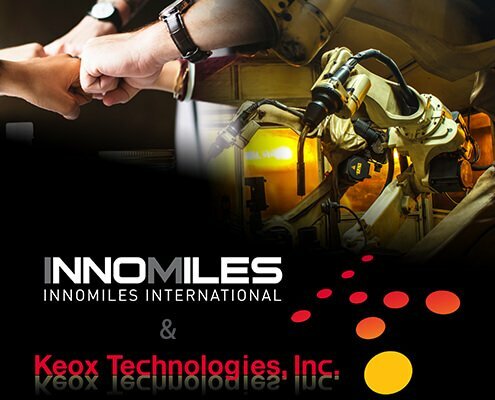 Keox Technologies, Inc. and Innomiles International Co., Ltd. have announced a strategic partnership offering industrial machine vision solutions for customers in Asia and North America. This co-operation will establish solid business relationship in both Asia and North America by offering reliable and scalable solutions for the manufacturing inspection of industrial vision in different applications. Innomiles teams have been dedicated to identification and industrial applications more than twenty years. Hardware and software have been designed based on years of firsthand experience working closely with customers. Innomiles clients can be found in the fields of manufacturing, retail, transportation, food industry, logistics, and healthcare, as well as kiosk. Keox Technologies is dedicated in designing, manufacturing, and integrating machine vision systems and other non-contact technologies used for inspection, measurement, and metrology in USA and Asia. The engineers at Keox Technologies have in-depth experience with many of the difficult challenges that are encountered in modern-day manufacturing.